Now that we’re in the heart of summer, many people (and their pets) are struggling to find ways to beat the heat while still developing healthy lifestyles through exercise. For us humans, a controlled environment like a gym or a specialized routine with a personal trainer is ideal. For our pets, much the same is true! As we all know, summer in Houston is HOT, and our pets are much more affected by heat and outdoor exercise than the average human. An indoor, monitored environment is the best place for our pets to get back in shape, especially those pets that are just beginning their fitness initiatives. Fitness is a great goal (for both humans and canines!) but it’s very important to build an exercise regimen that will protect your pet from injury; one of the best ways for your pet to achieve a healthy fitness goal is through an individualized program specifically for your pet’s needs. A physical therapist specializing in animal rehabilitation can develop a plan that is tailor-made for your pet, taking into account his or her current fitness level, age, and other health concerns. When pets are overweight, their entire bodies experience increased stress, contributing to increased risk of orthopedic injury, as well as accelerating the progression of any arthritis they already have. Unhealthy pets can also be affected by problems like heart disease, diabetes (yes, our pets can get diabetes! ), skin problems, and can even lead to the premature death of the pet. Pets’ individual needs can be met through customized individual programs designed by a Physical Therapist specializing in animal rehabilitation. 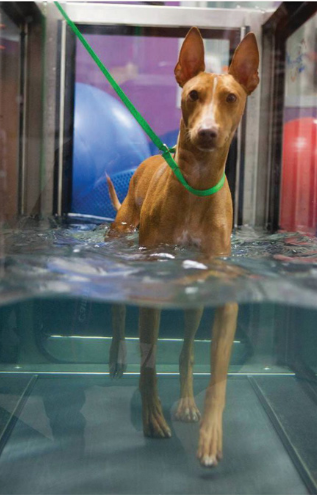 For out of shape dogs focusing on weight loss, for example, exercise in a water treadmill system allows the physical therapist to modulate the intensity of the patients’ work-outs through water height and the speed of the treadmill belt. The buoyancy of the water also protects patients’ joints against disproportionate concussive forces generated by excess body weight, all while resisting movements for strengthening. Appropriate water temperature aids in effective cooling; the added benefit of being indoors is enjoying the air conditioning! Each individual patient’s needs and the goals for therapy determine how each of these treatment variables are employed. In addition to cardiovascular exercise in an underwater treadmill, the physical therapist can incorporate additional “land-based” therapeutic exercises to address all facets of wellness and fitness, including strengthening, balance training/body awareness, and coordination activities. Dogs with orthopedic issues, such as osteoarthritis or joint diseases, experience particular benefits from these activities; dogs without orthopedic disorders can attenuate their risk of developing them. Stretching, massage, and physical modalities (including LASER, ultrasound, and electrical stimulation) may be employed for dogs with additional needs as well. Now is always the best time to begin a habit of healthiness for both you and your pet, but it’s important to work with a veterinary professional when starting out with your pet to avoid injury. If you would like to learn more about health and your pet, check with your family veterinarian, or consider a referral to a physical therapist specializing in animal rehabilitation. Your pet will thank you!